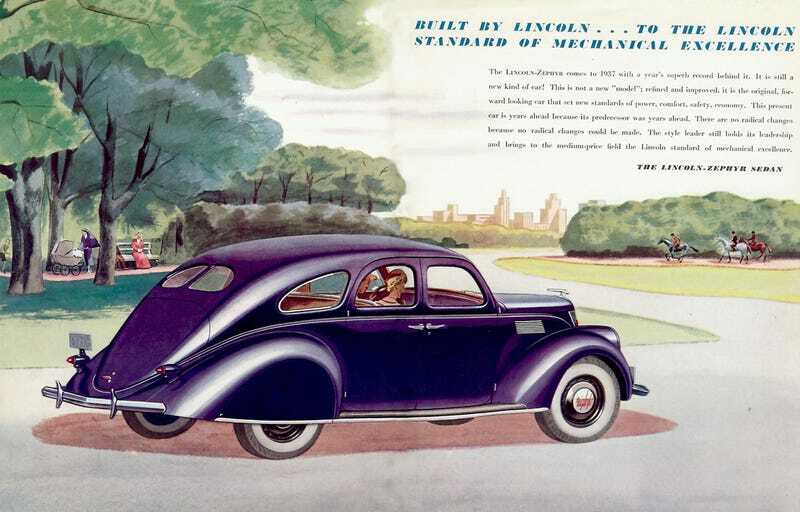 Nothing like the Hindenburg to liven up the 1937 Lincoln Zephyr! Another famous teardrop from the era was the Hindenburg, a giant 800-foot-long German zeppelin that was a floating luxury hotel and could cross the Atlantic from Germany to New Jersey in three days. Sadly, 1937 was the final year for the Hindenburg—and zeppelins in general—because the thing was filled with explosive hydrogen and caught fire while landing. A Lincoln Zephyr would have looked right at home at the aerodrome in Lakehurst, New Jersey, though. This strange history lesson brought to you by the February 2015 issue of Vintage Roadcar magazine. Of course, this isn't the only Hindenburg reference this week. To its credit, this issue also has a column by publisher/editor Casey Annis about the frivolity of Gullwing doors as design statements rather than engineering solutions, a sentiment with which I wholeheartedly agree. (Would Moss be caught dead driving a Bricklin?) But that's neither here nor there. Buy me a beer or three and I'll eventually treat you to my rant on why the worst thing about the Mercedes-Benz SLS were those blitheringly useless doors.